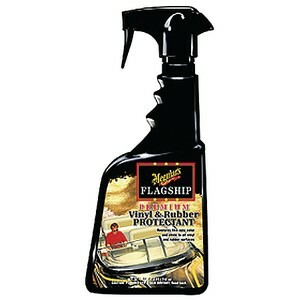 Meguiar's Flagship Vinyl & Rubber Protectant is perfect for restoring like new color and shine to your boat's vinyl and rubber surfaces. Meguiar's Flagship Vinyl & Rubber Protectant is perfect for restoring like new color and shine to your boat's vinyl and rubber surfaces. Specially formulated with cleaning agents that help remove dirt and grime to prevent dulling or discoloring of your boat's vinyl. Meguiar's Flagship Vinyl & Rubber Protectant also gives your boat the UV protection it needs to keep those colors looking bright and vibrant!